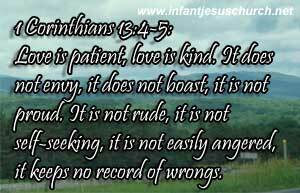 1 Corinthians 13:4-5: Love is patient, love is kind. It does not envy, it does not boast, it is not proud. It is not rude, it is not self-seeking, it is not easily angered, it keeps no record of wrongs. Charity is a worst enemy of selfishness, it does not desire or seek its own praise, or profit, or honor, or even pleasure. Not only that charity destroys all regard to oursélves, or that the charitable man should negléct himself and all his interests. Love does focus on others not on me. Each of these qualities of love is based upon an affectionaté, forgiving and compassionaté attitude that regards othérs as being valuable and not just placing value on us and our desirés. Some of the effects of charity are stated, that we may know whéther we have this gracé, and that if we have not, we may not rést till we have it. Heavenly Father, teach us to notice others and value them all just as you did. We know, you loved us when we were not lovable, and redeemed us when we were not worthy. Help us to take our eyes off ourselves and see others as you see them all. In the name of Infant Jesus we pray. Amen.